Perfect for groups ranging from 10-100, the Radical Race motivates individuals with tasks such as a culinary challenge, a blind wine tasting, tent building and much more! The combination of mental and physical tasks makes it so that everyone in the group regardless of age, physical ability, or interests. While searching for clues and performing tasks, team members must work together using their skill and knowledge to solve riddles and problems. The Interlaken Radical Race has proved to be a great way to build strong relationships between team members- especially if there is a wide age gap in your group. 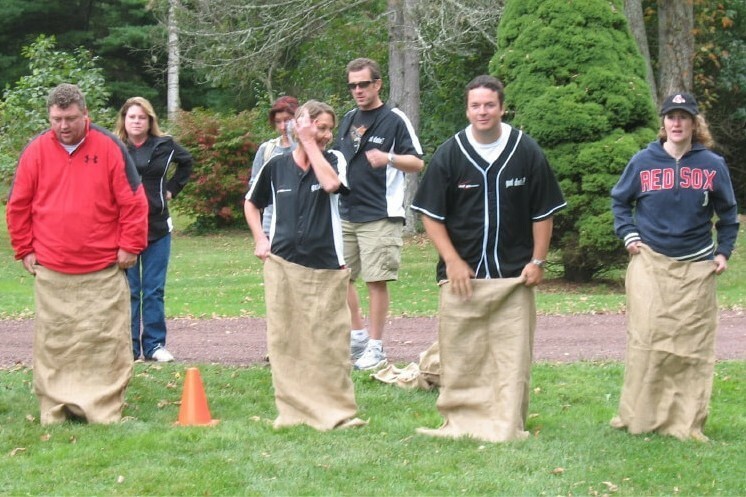 The Radical Race exercise can easily be designed to suit your group’s needs, taking both your time commitment and agility into consideration, so this makes planning easy if flexibility is needed for your group outing. "Thank YOU and Liz! We thought it was a great day. The Interlaken met all our needs for a meeting facility - the food and service was terrific! And the Radical Race far exceeded our expectations!" Clue: Though I am not named after a way to have your eggs prepared, I am considered Interlaken’s Bed and Breakfast accommodations. I am ancient and beautiful. Find the area that “wraps around” and you will find your next task. Clue: Many brides have said, “I Do” here…this is the most popular ceremony site on property…my road is in between two white posts…find me and you will find your next task.